Tioman island is home to a large diversity of coral reefs and abundant marine life. This holiday island of Tioman is widely popular amongst International tourists, Singaporeans and Malaysians. This island boasts a wide variety of hotels, resorts, dive centres, natural parks and beaches. 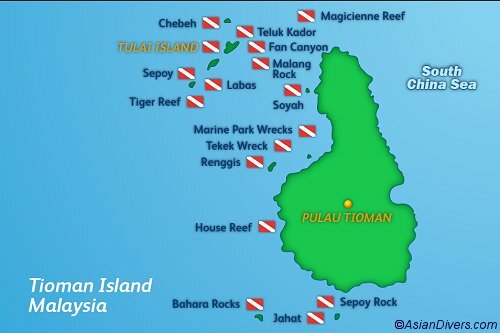 Tioman is also a protected site with various diving options, ranging from sheltered bays and pinnacles. Several ship wrecks and an large collection of marine life can be found around Tioman, making it a great destination for any scuba diver.